The word asteyam is also very important for a yogī. 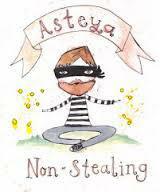 Asteyam means “to refrain from theft.” In the broader sense, everyone who accumulates more than he needs is a thief. According to spiritual communism, one cannot possess more than he needs for his personal maintenance. That is the law of nature. Anyone who accumulates more money or more possessions than he needs is called a thief, and one who simply accumulates wealth without spending for sacrifice or for worship of the Personality of Godhead is a great thief. 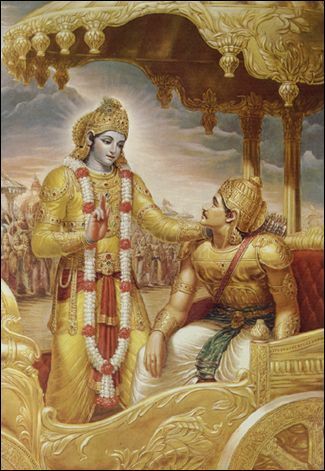 The Lord's proprietorship over everything within the universe is confirmed in Bhagavad Gita 7.4-5. Both aparā prakṛtis(like earth, water, fire, air, ether, mind, intelligence and ego), or parā prakrutis(living being), are emanations from the Lord, and ultimately He is the controller of everything that exists. There is nothing in the universe that does not belong to either the parā or the aparā prakṛti; therefore everything is the property of the Supreme Being. Take, for example, our dwelling, which is made of earth, wood, stone, iron, cement and so many other material things. If we think in terms of Śrī Īśopaniṣad, we must know that we cannot produce any of these building materials ourselves. We can simply bring them together and transform them into different shapes by our labor. A laborer cannot claim to be a proprietor of a thing just because he has worked hard to manufacture it. The human race should take the Vedic wisdom of Śrī Īśopaniṣad and not quarrel over material possessions. One must be satisfied with whatever privileges are given to him by the mercy of the Lord. There can be no peace if the communists or capitalists or any other party claims proprietorship over the resources of nature, which are entirely the property of the Lord.